The following letter has been sent to SBS Transit. We are awaiting its reply. I have never seen anything like that in all my 20 years of taking public bus. 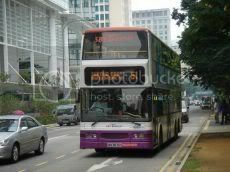 On 28th July 2009, at about 7.15pm, my mum and I were waiting for bus service number 80 along Upper Serangoon road. The bus finally came at about 7.40pm (SBS9281Y). As we always take this bus service to catch a charity show at 8pm, we noted that the bus seemed to have arrived slightly late. We boarded the bus. On nearing our desired destination along MacPherson road, a passenger pressed the bell. We readied ourselves to alight. However, to our alarm, the bus veered off from first lane to the second. Other passengers who wanted to disembark at the same stop started asking the driver why he had not stopped at the bus stop. The driver quietly replied that he “forgot” to stop. I found that hard to believe. The bus stop between the last one (which he has stopped) to the bus stop in dispute is very near. The driver would only need to keep to the first lane for the next 200m or so. I noticed that the traffic was quite congested near the bus stop that we wanted to alight at. Was the driver behind schedule, and in his haste to play catch up, “overlooked” one bus stop? I requested the driver to issue complimentary tickets so that we could take a bus back to our destination but he refused, challenging us to make a complaint against him with no apology whatsoever. Subsequently, he abruptly stopped his vehicle by the roadside and opened the doors without another word. My mum, eager to catch the 8pm show which she was already late for, beckoned me to get down. We had to walk about a hundred metres back. Four of the five alighting passengers, including my mum, were senior citizens aged above 60 years. I urge SBS Transit to look into this matter seriously and give me a satisfactory answer.